Whenever we drove pass Burmah Road, you will tend to look at both side of the shop houses, especially your car stop at the traffic light in front of Penang Plaza. You will tend to look on the left which is the luxury car – BMW show room, or Penang Plaza. Further up would be the shop houses like Hot Wok is there, BBQ Ribs used to be there, but now closed already. Whenever I drove pass, I will tend to wonder Hot Wok’s Hokkien Mee, is it delicious in tasting. Of course, is always wondering but ever have a chance to visit till recently we both really running out of idea what to have. That day we just parked our car in Penang Plaza, and walked in to Hot Wok, can’t remember where we heard it from, a bowl of Hokkien Mee in Hot Wok costs RM7-00 and it’s one of the expensive Hokkien Mee in town. Actually I was a bit skeptical to step in, but hubby as usual has the adventurous spirit to try on. What can I say more, right?? 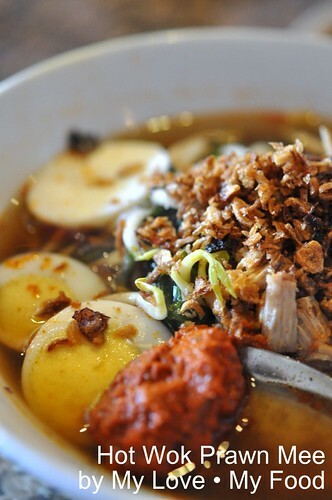 Honestly, that bowl of Hokkien Mee is pretty good, is delicious as the one we tried in One Corner Café in Bawasah Road. 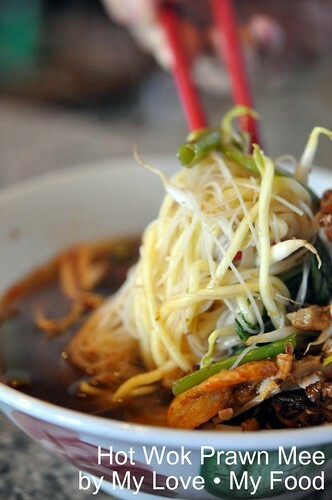 Soup base is full of prawn aroma, with added fried shallots sprinkle on top of the bowl of noodles, and when you bite on it, you can hear the crunchy sound on those fried shallots. Well, doesn’t that sound like heaven to you? Well, it does to hubby and me. 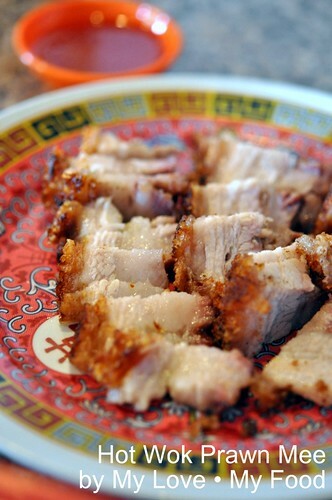 Not to forget with a plate of Roasted Pork, you can either op to have the roasted pork in the bowl or separately serve. And guess what? 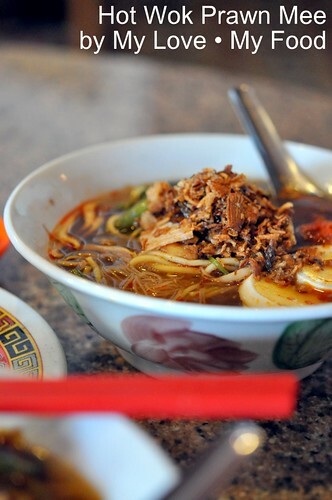 That bowl of fragrant, tantalizing, delicious and mouth watering prawn noodles do make up our day, and it’s only costs RM4-00. Beside the Giant Supermarket in Penang Plaza & diagonally opposite the BMW car showroom. 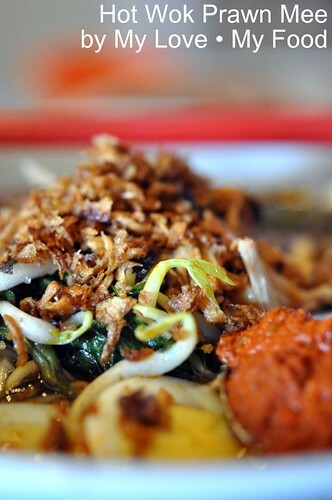 The Hokkien Mee is reasonably priced and moreover customers get to eat in a comfortable environment too. I love the hokkien mee there too and also the pork fried chin calok is nice too. Hokkien is cheaper. Very delicious and mouth watering item. sounds like it was a bowl make for heaven! Definitely the finest in Penang! 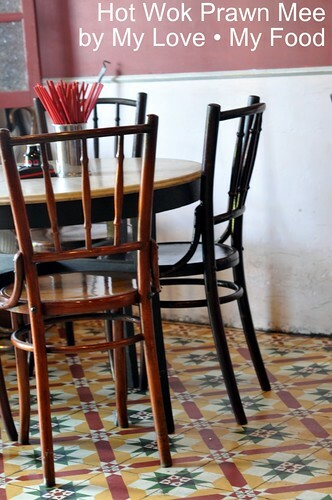 I love the tiles on the floor. Very artsy and colourful. And the siew yuk... looks very good too. OHhhhh The siew yoke!! What I would give to taste the delicious siew yoke!! Hey, I wanna ask something regarding the hot wok address. Is this the old or new address? Cause I went there last year but it was closed. Thanks. I'm going to penang this friday and it would be a drag to miss the delicious nyonya food again. Thanks a million. Hi sirun, the last I know the shop has closed down. Have no idea where is it.